Facial hair, once swollen and waterlogged, loses resilience and puts up less of a fight against your razor. Showering before shaving is essential, and it is a good idea to spend a minute just dousing your beard hairs in hot water. What this means for you once you get started is squeezing every ounce of sharpness out of your razor and getting that great one pass shave. Think about this: if you have to make multiple passes on tough hairs, how long is your blade going to stay sharp? Speaking of sharpness, contrary to popular belief, it is in fact dull blades that cause the most nicks, cuts, and scrapes—always use a sharp blade and a quality razor. Part of the reason is that finely honed blades will develop an uneven edge as they dull. You may not be surprised to find out that uneven is the opposite of smooth. Plus, instead of cutting through hairs, dull razors are often deflected off of them and as a result, they nick your skin. If you are noticing that you have to press harder with your razor or it’s not cutting your facial hair well then simply change the blade. Incidentally, this is why quality razors have heavy handles; you should not be placing pressure on the razor while you shave. Multi-blade razors can be a little more forgiving but the same principle applies—don’t apply any pressure to your razor and let its weight pull it across your face. 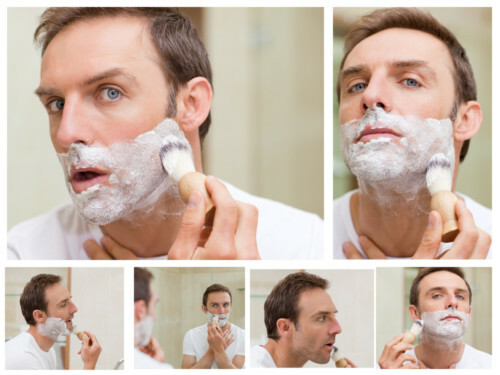 So, fill your facial hair with water and brush on a good shaving cream. Find brushes here.